The Sennitt’s Ice Cream brand was discontinued when Unilever acquired Sennitt’s and the company was merged with Streets. The famous polar bear logo disappeared, but the signs remain sought-after by collectors. In Victoria, by the 1950s, the choice was between Peters, Sennitt’s and Toppa, which was owned by the New Zealand based Tip Tip Ice Cream Co. Streets Ice Cream was Peters’s main competitor in New South Wales. At the beginning of the 1960s, Unilever Australia Pty Ltd decided to get into the ice cream business. Their first acquisition was Streets, in 1960. It seems the aim was to make the New South Wales favourite into a national brand. In 1961, Unilever acquired Sennitt’s. At that time the Victorian ice cream manufacturer was well-represented at milk bars around the state, but did not have the branded products to compete with Peters’ Choc-Wedge or Eskimo Pie. The decision was made to abandon the Sennitt’s brand in favour of Streets. Before long the Streets Cornetto was competing with the Peters Drumstick as branded and wrapped ice creams replaced the old-fashioned cones. 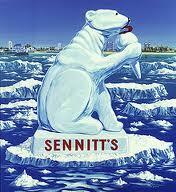 The famous Sennitt’s polar bear disappeared.